Micro and Mini Cable Clics are reusable and adjustable cable management solutions for use with earphones, chargers, personal electronics, small appliances, travel, and office accessories. The Cable Clics feature an easy squeeze-and-release locking latch that readily opens with one hand. Constructed with durable UV resistant polymers and stainless steel the Cable Clic's pivoting arm moves in a unique arc offering abundant space to collect and unbundle cables and cords. 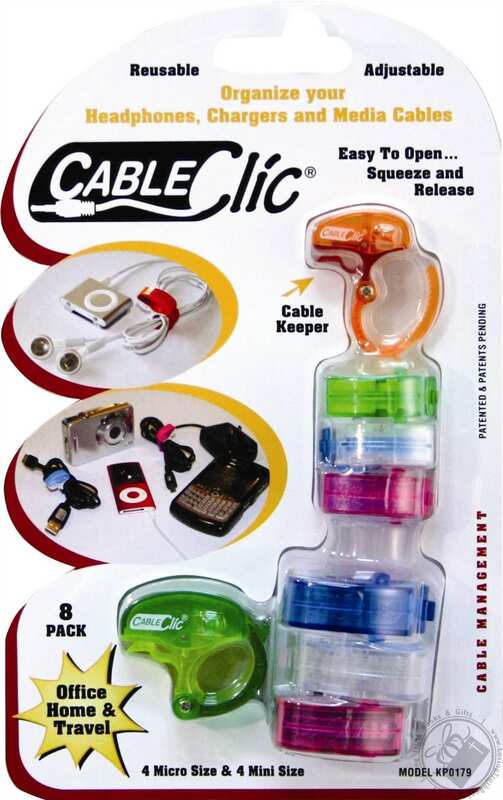 Its integrated ''Cable Keeper'' provides a convenient attachment point. Cable Clics combine design, function, and durability producing compact devices perfect for organizing personal electronics and small cables. The micro Cable Clic is for organizing bundles from 13/32" to 5/8", while the mini Cable Clic ranges from 5/8" to 1". This pack contains 4 multicolored micro Cable Clics and 4 multicolored mini Cable Clics.